Join us for our second annual fundraiser! 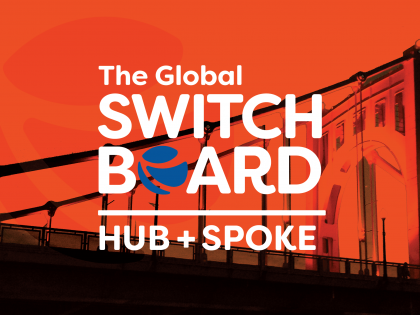 At Hub + Spoke 2018, guests will be greeted by member organizations of The Global Switchboard network. Through interactive experiences, guests will learn more about each organization and the impact of their work both globally and locally. Guests will mingle over food and drink, while enjoying views of the city and a series of montages containing personal stories drawn from the social media challenge, #BurghMeetsWorld. Guests will also learn more about The Global Switchboard’s collective impact work and how they can get involved. Following the opening reception, guests will gather for a formal presentation. The presentation will include a screening of short video stories highlighting how global issues impact local individuals everyday. Following the videos, The Global Switchboard and membership coalitions will present on the collective impact work in the following areas: equity in global education and workforce development in the immigrant and refugee communities. Guests will be given opportunities to get involved with and support this work! Appetizers and an open bar will be provided at the event! **We will have onsite childcare available provided by Flexable for children ages 2-18. If you’re interested, please email our Director of Operations at sara.noel@theglobalswitchboard.org. Fostering effective global engagement and inclusive dialogue through their network, our co-working space, and our digital hub.